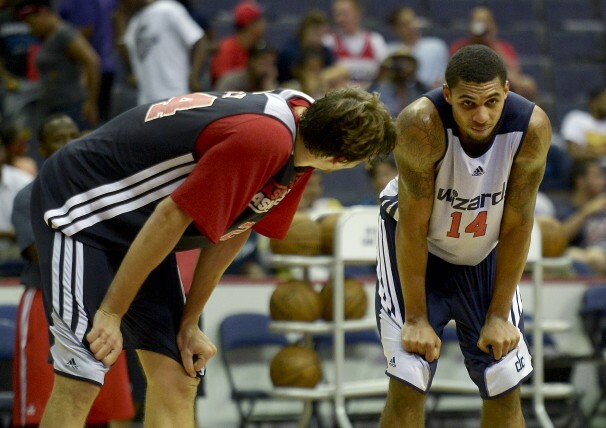 What Are the Wizards Getting In Glen Rice Jr.? Here’s the challenge in assessing what kind of pro Glen Rice Jr. could become: how to assess his performance in the NBA Development League. When I ran Rice’s college numbers through my stat-driven draft analysis machine (dubbed Ye Olde Draft Analyzer, or YODA for short), I became an instant skeptic of the team giving up two second round picks to get him. But after further analysis, the Wizards may have found a potential contributor. When the Wizards swapped those picks for Rice, there were two players available that had late first round grades in YODA: Nate Wolters and Zeke Marshall. Wolters was taken the pick after Rice, and ended up in Milwaukee. Marshall went undrafted and ended up signing to play in Poland. I had not been enamored with Rice in my pre-draft analysis, but my pre-draft analysis didn’t include an in-depth look at Rice’s D-League play. And that performance suggests that they Wizards have found a youngster with the ability to be a solid backup at SG or SF. But let’s back up. Why was I skeptical? Answer: Rice’s college performance was unimpressive. As a freshman, he had a second round grade in YODA. As a sophomore and a junior, he landed solidly in “do not draft” territory. Not “don’t draft in the first round,” but rather — don’t draft at all. Rice did improve his rebounding during his college career, but he was inefficient offensively and exhibited sub-par shooting from both the three-point line and the free throw line. The add in the arrest and other “character issues” and it’s not exactly a recipe for future NBA success. Then he went to the D-League and did an abrupt about face. He converted a high percentage from two-point range, shot well from downtown, and boosted his free throw percentage to about the NBA average. He rebounded well, handed out assists, stole the ball, blocked shots, and trimmed his turnover rate. In short, he grew up and began to produce at the level of his purported talent level. If he’d produced like that as an NCAA senior (assuming he played a schedule of average difficulty), he’d have rated as a mid-first round pick in YODA — even with a ding for those “character issues.” Of course, that was D-League production, not college. And I haven’t done sufficient research to determine whether the level of competition is comparable. With the exhibition season starting tonight, we’ll soon get a sense for what Rice will be able to do. Based on what he did in the D-League, it’s safe to say that he at least has the potential to be a useful NBA player. Which would be a good outcome to get from a couple of second round picks.